The best part about living in a city? Endless access to amazing cafes, restaurants and late-night eateries. Since Sacramento is pretty veg-friendly, BL and I have no problem finding at least a few items we can eat on almost every menu in the City. Or we call ahead and beg the chef to create a meat-less meal, whatever works. A few weeks ago, we tried a new, happening spot, Low Brau for all things german: Beer & Sausages. I was so excited I almost ordered all three varieties. Luckily, BL helps take me down a notch or two when I get like this. It’s one of the many reasons I love him so much. You know when you try a food you haven’t had in a while and all of a sudden you don’t know how you lived without it? Like multiple times a week had to have it? That’s how we were after enjoying our vegan pretzel roll sausages. 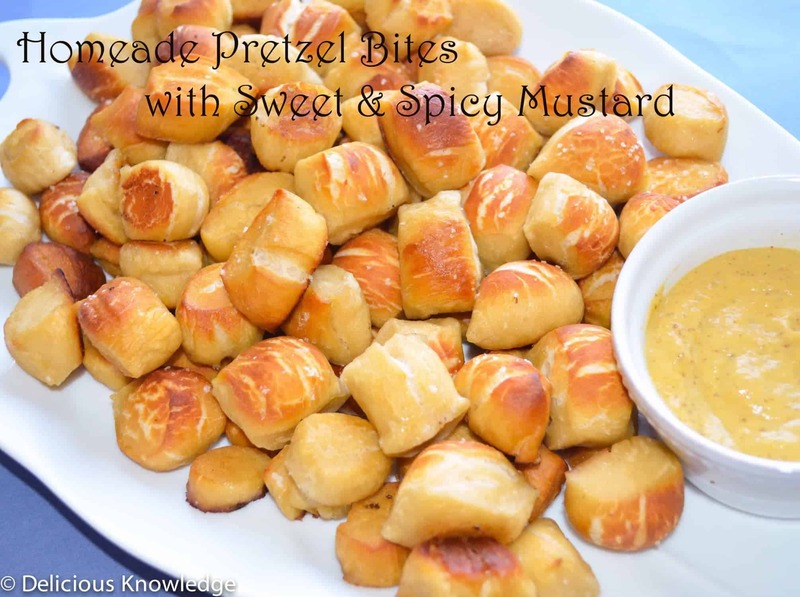 Since I sometimes have portion control issues, I wanted to create a pretzel that I could snack on throughout the day, without committing to a full pretzel. That way, when I end up eating 1/2 the batch, I don’t feel like I’ve consumed 4 large pretzels before dinner. Plus, everyone knows that bite size food is so much cuter than the real version. It’s a fact. 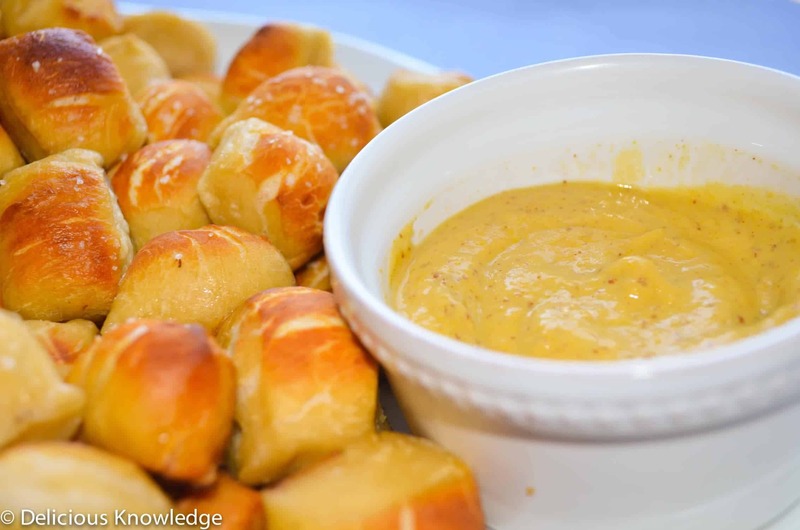 I can’t imagine a soft pretzel without spicy mustard, but feel free to experiment with your favorite sauces. 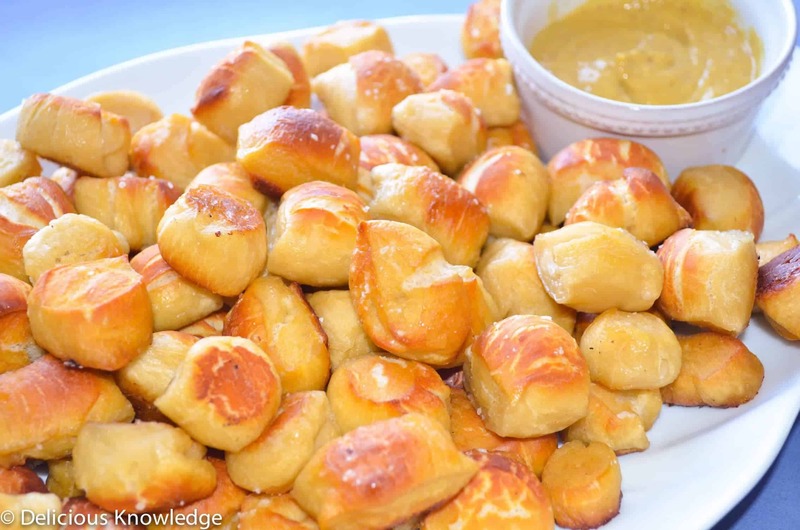 In a stand mixer, combine the water, sugar, yeast, and butter. Mix with the dough hook until just combined. Let sit for 8 minutes. Add the salt and flour, 1 cup at a time, and mix on a low speed until combined. Increase speed and knead until the dough begins to pull away from the side of the bowl. Lightly oil a bowl with oil and add the ball of dough. Cover with a clean towel and place in a warm spot until the dough has doubled in size, about 50-60 minutes. Bring 10 cups of water to a boil and add the baking soda. 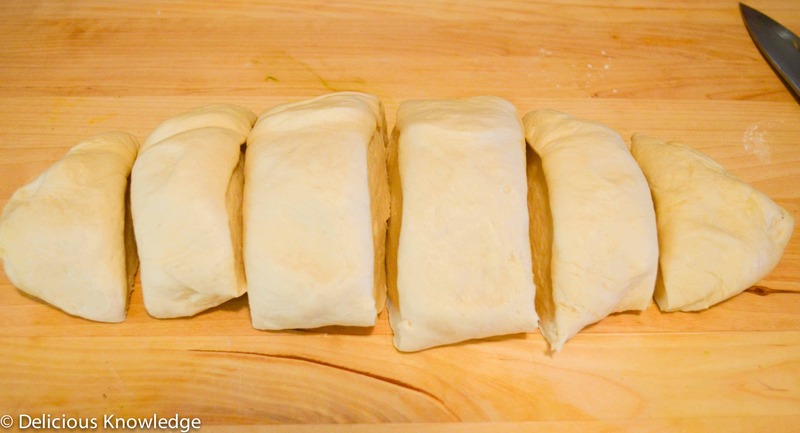 Remove the dough from the bowl and gently form into a rectangle. 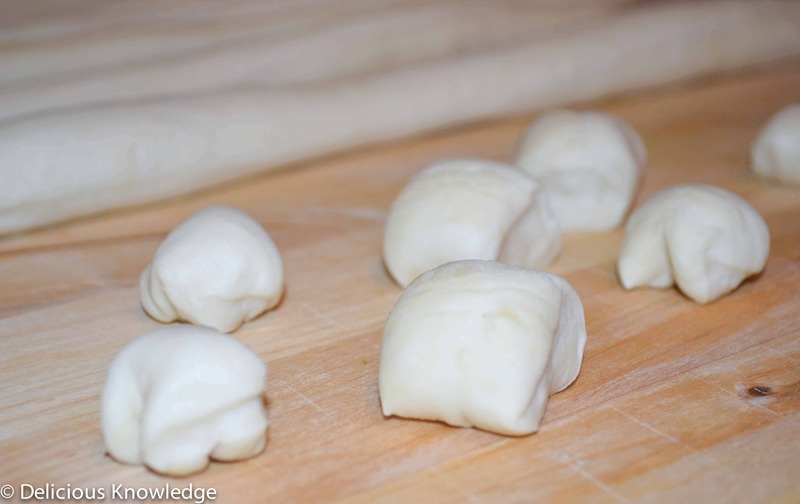 Divide the dough into 6-8 pieces. 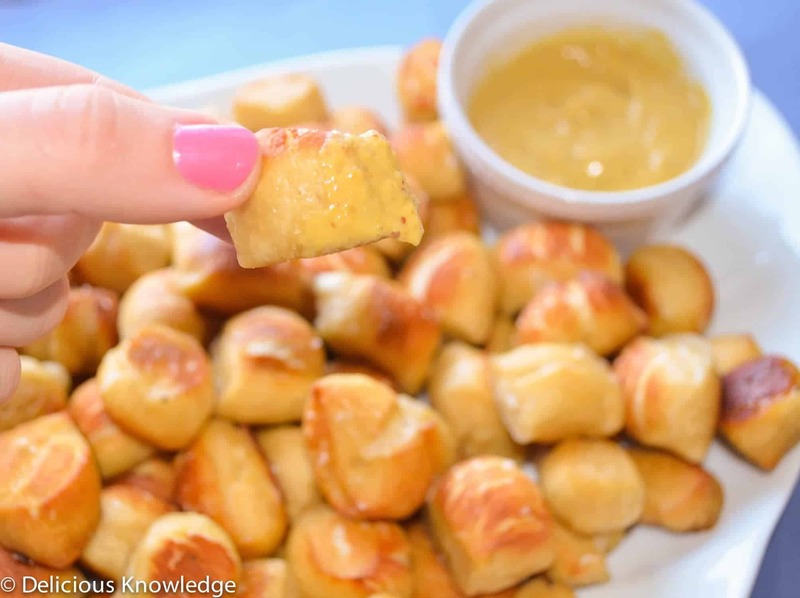 Roll each piece into a long rope and cut the dough into ~one inch pieces to make the pretzel bites. Add the bites to the baking soda and water solution and boil for about 30 seconds, until they have risen to the top. Remove with a slotted spoon and place onto a greased baking sheet. Make sure they are not touching. 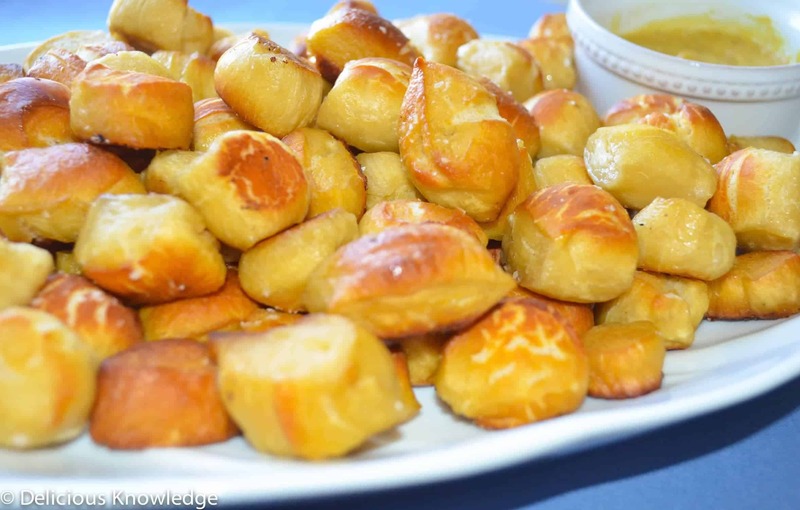 Brush the tops with soy milk and sprinkle with the salt. Whisk together mustard powder and 1/4 cup of the beer or water in a small heatproof bowl and let sit at room temperature for at least 10 minutes. Meanwhile, bring 1 inch of water to a simmer in a small pot. Add vinegar, garlic, brown sugar, agave nectar, and salt to mustard mixture and whisk to combine. Place the bowl over the simmering water (the bowl shouldn’t touch the water) and cook, stirring frequently, until the mustard is slightly thickened and yellow-brown and the taste has mellowed a little, about 7 to 10 minutes. Refrigerated at least 24 hours before using. Bomb! Putting Aunt Annie’s out of business.